The material you choose for your garage door must be informed by several factors including weather, whether or not you intend to insulate your garage and how long you want to keep the door. You also must put into consideration the primary uses of your garage. If you install an automatic door, ensure your service provider adheres to safety standards prescribed by the government. Here are the most common options. Wood has a natural look, is affordable and is easy to work with. 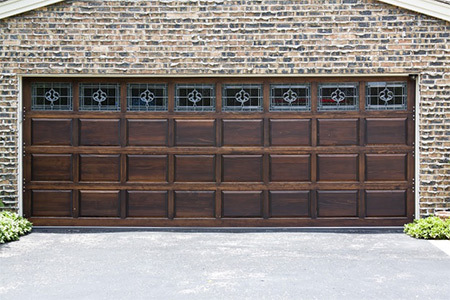 Wooden garage doors also offer flexibility and an abundance of design options. You can stain your garage door to achieve a customized look that compliments your home’s exteriors. Wood is also an architecturally accurate option if you are looking for earthy, historical, or rustic themes. The main downside when using a wooden garage door is the upkeep that comes with that choice. Wooden doors require regular sanding, repainting and refinishing. Without proper maintenance, they can absorb moisture and rot. Wood is also expensive. Steel garage doors are a popular choice for busy home owners because it requires little or no maintenance. Since steel is ductile, a designer can work on varying panel styles to customize your design. It is also easy to experiment with colors with steel doors to enhance the appearance. The price is fair making it a more economical option if you are on a tight budget. The primary concern for steel doors is a wide variation of prices and quality. Poor quality steel doors have less insulation and can increase your energy bills. It is, therefore, paramount that you work with an expert to ensure a seller does not dupe you into buying an inferior material. Modern vinyl comes with customized colors and finishes, which allows you to add a personal look to your home. You can get one that will give you a wooden look without the challenges associated with wood. Vinyl requires minimal maintenance, is rust resistant, and durable, which saves you money in the long term. And although it is more expensive than steel, vinyl is a more affordable than aluminum and wood. One of the biggest pluses for a vinyl garage door is the fact that you can buy one with internal insulation, which improves your home’s energy efficiency. Before you settle for a vinyl garage door, it is important to understand that you will not be able to change its color as you would a wooden door. If you are one to alter the colors of your exterior regularly, it is not for you. Also, if you buy one without insulation, it is hard to maintain consistent temperatures in your garage. If you plan to install your garage door yourself, aluminum is an excellent choice because it is lightweight and easy to install. A contractor will also take less time to install it, which can save you labor costs. It also puts less strain on other parts such as the door opener and torsion spring. The results are fewer maintenance costs. Aluminum does not rust, and its non-corrosive nature makes it superb for coastal and wet areas. It is eco-friendly, recyclable, paintable, and you can emboss it with a stylish, customized texture. The major drawback for aluminum is that is bends and can dent easily. If you live in a place with frequent hail storms, high winds or have a lot of children playing around, there is a high probability your garage door will get dents. Choosing a garage door should not be an arduous task. It boils down to your needs. If for example, you are looking for authenticity, wood would be a good choice. If low maintenance is a priority for you, try steel. If you are seeking assistance on what best suits your space, garage doors operating systems, or repairs, visit Premier Door Corp or check their website for plenty of options and expert advice.